The Food Super Heroes have got a new team member. 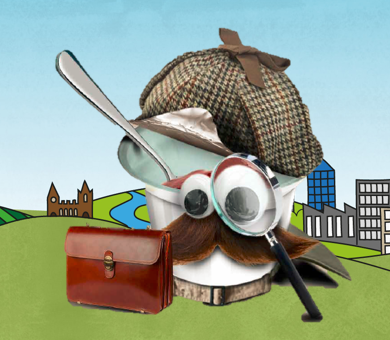 We are pleased to introduce our brand new Food Super Hero, Detective Yan the Yoghurt…! We know how much children love the Food Super Hero team and we’re sure our new team member, Detective Yan the Yoghurt will be a massive hit with them. Detective Yan the Yoghurt won’t only teach children about the benefits of eating yoghurt he may also bring out their inner Sherlock Holmes as they learn about his investigative talents! When it comes to bone-strengthening calcium, Detective Yan the Yoghurt is on the case. His mission is simple, to educate the children about the benefits of calcium. Not only does calcium keep the nation’s bones strong it also helps keeping everyone’s teeth strong too! Staying Healthy Over ChristmasWill you be enjoying a theme day in March?